Its a phrase we hear occasionally. "It's the crux of the matter". Crux is the Latin word for cross. Yes, the cross of Christ is the crux of Christianity. Although it was the power of the cross, that changed the course of human history, we don't hear much, about the power of the cross, these days in our churches. atmosphere in the garden of Gethsemane on the night when Jesus was arrested and later put to death. Fast forward fifth days hence. These same disciples were risking their lives for Jesus. What happened ? It was the Resurrection of Christ from the dead. It was the "Power of the Cross." On the cross, came two of our Lord's famous sayings. "Father, forgive them, for they don't know what they are doing" (Luke 23:34). And then, when Jesus stated "It Is Finished", he bowed His head and died. (John 19:28-30). You see, Jesus came to make propitiation for our sins (Romans 5:6-11). He came to give reconciliation between God and man (Ephesians 5:25-27). He came to purify the church (Philippians 2:5-11). 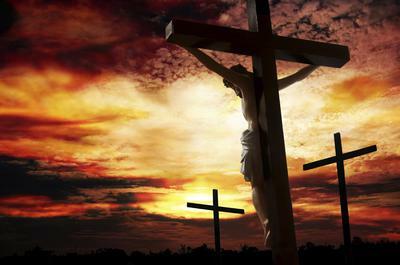 And He came to glorify the Father through His life, death, and resurrection (Hebrews 4:14-16). Our Father God picked the best that heaven could offer, His perfect and only Son, and sent Him to earth to pay the penalty for our sins. The cross is the crux of Christ's work, because it is the one and only way God has chosen to bring us back into a loving relationship with Him. It rescued us from the curse of sin (Galatians 3:13). It cancelled the record of the charges against us (Colossians 2:14). And, by the cross, Christ personally carried our sins in His body (1 Peter2:24). Yes. the "Power of the Cross" did it all. It gave us the full gospel (1 Cor 15:1-4). I trust you will enjoy reading these simple but explosive song lyrics, entitled "When The Power Came Down". Amen!